The Tower Station and U-Drop Inn Café is located along historic Route 66 in Shamrock. Built in 1936 by J. M. Tindall and R. C. Lewis at the cost of $23,000, this gem of a building got its start in the dust when John Nunn drew his idea for the station on the ground with an old nail. Plans were later given to architect Joseph Berry who set the final wheels in motion. With its Art Deco detailing and two towers, the building was designed and constructed to be three separate structures. The first was the Tower Conoco Station, named for the dominating four-sided obelisk rising from the flat roof and topped by a metal tulip. The second was the U-Drop Inn Café, which got its name from a local schooolboy's winning entry in a naming contest. The third structure was supposed to be a retail store that instead became an overflow seating area for the café. 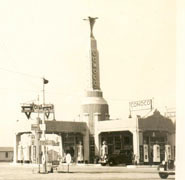 The Tower Station was the first commercial business located on the newly designated Route 66 in Shamrock, and is one of the most imposing and architecturally creative buildings along the length of the road. Until about the late 1970s, the Tower Station and U-Drop Inn Café was light brick with green glazed tiles. Now refurbished with light pink concrete highlighted by green paint, it still looks much the same as it did during the heyday of the Mother Road. The towering spire above the service station still spells out C-O-N-O-C-O, a reminder of the booming business that the Tower Station and U-Drop Inn Café once saw. Today, the City of Shamrock owns the building, which it has fully restored using a Federal Transportation Enhancements Grant and local fundraising. Visitors are welcome to the station, which is now operating as a visitor center, chamber of commerce office, and community center. 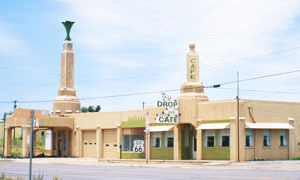 The Tower Station and U-Drop Inn Café is located at 101 East 12th St. at the intersection of US Highway 83 and Historic Route 66 in Shamrock, TX about six blocks north of Shamrock’s downtown commercial district. Today, the building houses the Shamrock Chamber of Commerce, which can be reached by telephone at 806-256-2501 or through its website. Visitors are welcome.